Ticks are a group of ectoparasites responsible for major losses amongst livestock. Ticks cause anaemia, transmit diseases and cause direct damage to wool and hides. The life-cycle of ticks consists of four stages; egg, larva, nymph and adult. The larva and nymph have to take a blood meal from a host before they are able to moult to the next stage. 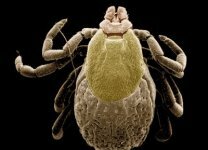 Adult ticks require blood for reproduction. They are able to survive for up to two years without feeding. Once they attach to a host they feed for about a week before mating. The female then lays eggs. There are two families of ticks; the Ixodids or hard ticks and the Argasids or soft ticks. Hard ticks are the most common ticks found on cattle and sheep. They have a hard dorsal scutum. Click on each for more details. Soft ticks or argasids have a leathery integument or skin instead of a hard dorsal scutum as in ixodid ticks. Soft ticks of the genus Ornithodorus transmit relapsing fever (spirochaetosis) to humans. Ticks cause anaemia, transmit diseases and damage wool and hides .